Line Rider slides from a PC Flash game to the consoles: will it ride to success or crash into failure? 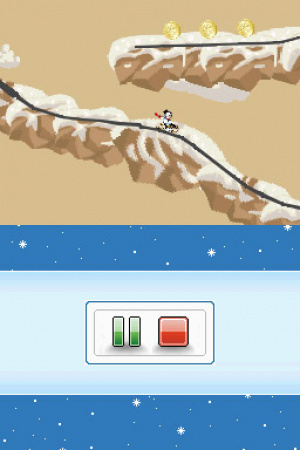 Line Rider was originally a simple Flash game where players could freely draw slopes for their sledder to ride down. Even though the game had little structure or goals, it gained considerable popularity among PC gamers, which resulted with many individuals posting their tracks on YouTube – some of which are astounding – for others to enjoy. So, for the retail sequel the developers had to create an equilibrium between free roam creativity and a clear set of objectives. 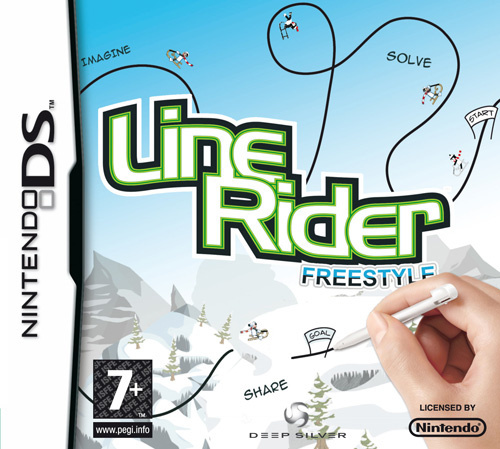 Line Rider: Freestyle manages to blend these two aspects fluently, but sadly there are some issues that diminish its overall success. The game itself has three modes of play: Story mode, Freestyle and Puzzle. The story mode is given a fragile context based around a lovesick rivalry between our hero Bosh and his counterpart Chaz, both of whom are competing for the affections of Bailey, a beautiful blonde who sits at the nexus of this testosterone-fuelled sledding. This simple storyline is presented to the player through cut scenes shown at five level intervals. Unfortunately, the cut scenes suffer from appalling frame rates making it hard to appreciate their slap stick comedy. Nevertheless, this does not detract from the gameplay and will not impact on the overall experience. The story mode is composed of 50 levels all designed to test your sledge-sliding skills. These levels are all based around the same structure, consisting of a start position, the goal and various mandatory targets (coins) that must be collected along the way. 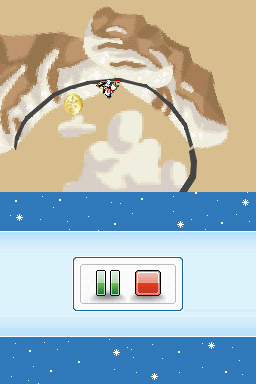 The player’s task is to fill in the gaps within the path so that Bosh can gather all the coins and arrive safely at the end goal. There are three types of lines that help you achieve this objective: normal blue lines, red speed up lines and yellow slow down lines. The player will have to utilize all three to navigate Bosh successfully down the mountain. All the levels offer diverse solutions to achieving the end goal but the trial-and-error gameplay can be very frustrating. On a particular level we managed to place all of the lines except for one - the last one - in the right place. As such, every time we edited the final line we would need to watch Bosh go down the entire course before we could check said line. This gets very mundane and repetitive; it would be interesting to see a fast forward function to cancel out this annoyance. Furthermore, what the player may not realise is depending on which way you draw the line, what you can do on it differs. The black side (created by going right to left) is what you ride on and the blue side (formed by drawing left to right) can be passed through. This function may have been introduced to create an idea of depth but all it does is cause confusion, as the game makes no attempt to explain this feature. Moreover, editing the lines you have already drawn causes frustration beyond measure. You can either move the line completely, or adjust small segments of the line itself, which more often than not refuse to move and make a mocking sound, exacerbating your already irritated mood to just pure wrath. In addition to this, you can not draw past the screen in a game that often requires the player to. So, connecting multiple lines together often results in an inharmonious jangle of slopes that send Bosh to his doom. In short, it is best just to erase the line and start from scratch making this trial-and-error game less enjoyable. Now, you would think that a game based around physics would have very few inconsistencies in it, but sadly Line Rider is overflowing with them. At points, Bosh will land on a line but not connect causing the player to revise all their hard work, and he might even sometimes land on his head but not fall off his sled, yet the slightest bump sends him soaring through the air. It is disappointing that little was done to minimise these contradictory moments in the game which only serve to add to the player's ever-mounting frustration. The music within Line Rider will do nothing to limit that annoyance - it's nothing special and consists of jaunty techno beats that get rather repetitive over time. Yet, they do fit the game's pace and match the gameplay perfectly, and as always if you get annoyed you can always turn it off. As mentioned earlier, aside from story mode there are the Freestyle and Puzzle modes, where the more adventurous player can test their construction skills. 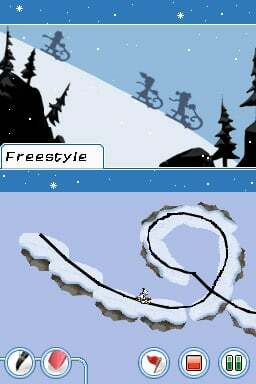 Freestyle is exactly the same as the original Line Rider, allowing players to create uninhibited runs for Bosh to slide down. Puzzle mode is essentially the same but permits the player to add obstacles and objectives similar to those in story mode. The gamer can then share these with friends locally or via the game's official website. Both these modes add a diverse element to the game, including even more lines, such as the trampoline which will hurtle Bosh into the air and scenery lines that will not affect Bosh’s course. This mode greatly increases the game's longevity and the overall appeal. 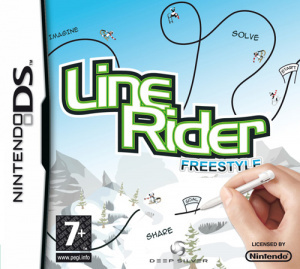 Line Rider: Freestyle has tried to turn a free online game into an enjoyable retail experience by adding new gameplay, enhanced visuals and sound but in our opinion falls short. The story mode can be satisfying when done correctly but is plagued with far too many irritations to maximise the game's full potential, which may be the result of developers wanting to ‘milk the cash cow’. Furthermore, although the Freestyle modes give the player a vast amount of opportunity they are susceptible to the flaws that exist in the story mode. As such, editing a line is just as frustrating, so these modes will only appeal to the avid sledders out there. It's a shame that this game relies on sheer persistence rather than skilful application. Still, if you are the creative type then Line Rider may have more to offer, and you may find it worth a slide. I had a feeling the over-excited previews were a bit OTT. It does seem an over-rated concept by the description of the gameplay. This is a perfect example of why the DSi is so important -- a game like this should never, ever be retail. It's an enjoyable, simple concept, but padding the original gameplay with pointless additional modes still will never justify a $30+ price tag. Make it an inexpensive download that just gives you the core line-rider experience you want and nothing more, or don't bother with it at all. @wariowoods.....exactly. I would pay 5 bucks for this in a heartbeat but Im not driving to a store to grab it for 30. Actually, I agree, as a dsiware purchase, I would download it.. I think the same can be said for a lot of games.